Your wishes will come true with Wish Master slot! Wish Master will make your dreams come true in a blink of an eye! Spin the reels now-you never know, maybe one spin will be enough to be the happiest casino player. This slot machine is made by NetEnt and has a great graphics with nice and valuable symbols. The beautifully carved symbols will give you the highest winnings. What's more, there is a magic lamp in the right corner, waiting for you to wish anything! Wish Master is a 5-reel, 20-betline online video slot and this means you will have great chances to win. Rub the lamp to meet the genie who can give you more kinds of Wilds and multipliers and cool features. There is a Scatter symbol on the reels. When it appears anywhere on the reels, the genie escapes from the lamp. Then a random feature will be activated and you will get 10 free spins. This is a great way to obtain good prizes and, furthermore, if a new Scatter symbol appears on the reels during the feature, the new one will be added to the feature inventory and you will see 5 additional free spins. However, a maximum of 3 of this feature can be active at the same time. If you are lucky to land a Scatter symbol when you already have three features, the first one will be replaced by a new feature. You will also be awarded with 5 extra spins. But wait, there's even more than this! There are purple and orange Extra Wilds. Either feature in the inventory will transform the appropriate symbol into a Wild symbol. Keep on reading, it's not over yet! Wild symbols substitute for the highest possible winning combination on a winning line. They can appear on any reels. Wilds substitute for all symbols except for Scatter symbols. When you can see an entire reel covered with the flaming Wild symbols, it will appear on the same reel as a Scatter symbol. It will activate the bonus feature. Speaking of these flaming Wilds, when any of them appears on the reels, turns into an Expanding Wild which will cover the whole reel. 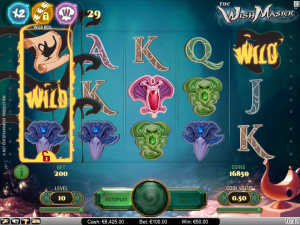 Wish Master online slot has Random Wilds, too. In each spin, 2 Floating Wilds can appear on the reels randomly. What about the multipliers? The wins are multiplied by 2 or 3. Of course, both can be active. That means all winnings will be multiplied by 6. It's worth playing Wish Master online slot, give it a try now! Pink, orange, green and blue ornaments with shiny gems can be seen along with the nicely carved classic A, K, Q and J symbols. For all combinations, see the Paytable by clicking on the information button in the left corner of the slot machine. Try Wish Master slot machine now with real money or for fun. You will enjoy this game for sure. Playing for real money makes the whole game more exciting. Get ready to meet the genie who will make your wishes come true. Good luck and play Wish Master now!